The tiny garment sat on my mother's coffee table in a crinkle of tissue paper. "Let me see, Ma. Did you finish it?" I took my time with the unwrapping, not wanting to rip the delicate paper. She watched me, waiting for my reaction. The sweater was for her great-grandchild-to-be, a girl. It was white, a symbol of newborn purity and a throwback to pre-sonogram days when nobody knew ahead of time whether the baby would be wearing pink or blue. The miniature cardigan was feather soft, a single row of creamy pearl buttons its only adornment. I imagined the little one swaddled within it, her pink cheeks peeking up over the collar, her arms . . . her arms completely lost in sleeves knit twice as long as they should have been. My heart sank. "Oh, Ma, what did you do?" I said. The oversized sleeves flopped down several inches beyond the bottom edge of the sweater, making it look like it was made for a chimpanzee. The worst part was that she did not see anything wrong with it. "What do you mean? It looks fine," she said. Ma's dementia had, to this point, taken the form of forgetfulness and mild confusion. She'd either not pay her bills or pay them twice. She flooded the kitchen a couple of times by forgetting to turn off the tap. But this seemingly minor knitting mistake represented a concrete and alarming sign of her cognitive decline. There was no question that knitting was good for her. The craft had, for decades, given my 90-year-old mother a solid sense of pride and accomplishment. The repetitive motions of wrapping and pulling stitches have a calming meditative effect, and the mathematics involved in structuring a garment is good exercise for the brain. Even with the dementia, it was the one skill she had been able to hold on to. It was an anchor that kept my mother from completely drifting away. Ma's knitting skills had strong family roots. My grandmother brought the craft with her from Italy in 1906, when knitting was more necessity than creative endeavor. Grandma's sweaters warmed seven children and 20 grandchildren before she turned the needles over to my aunt, Jenny, who then taught my mother how to knit. As Ma got older, she set her sights on me as the most likely next-generation knitter, and I reluctantly obliged. That was ten years ago, and now I click away at sweaters for my own grandchildren. 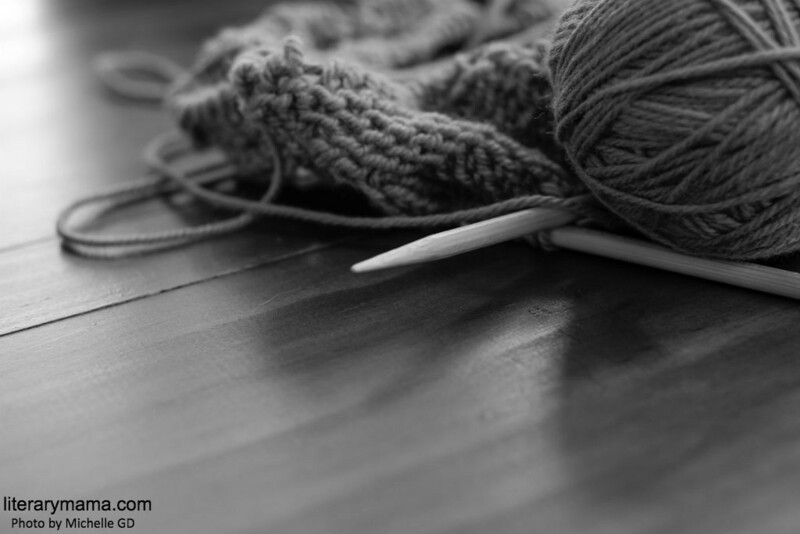 Each of us had "picked up the needles," an expression used when someone learns to knit. But there is no equivalent for the time in a knitter's life when the needles are put down because the craft becomes too difficult for a diminishing mind. Surely, I thought, she wasn't at that point yet. "Don't worry, Ma. I'll help you fix the sweater," I said. But who was I kidding? She wasn't worried, I was. Every time a new piece of evidence cropped up to prove her cognition was failing, I felt my shoulders droop further. Yesterday an envelope of cash went "missing" underneath her mattress, today an overgrown baby sweater needed fixing, but tomorrow, who knew? It could be anything, which was why my sisters and I took turns checking in on her every day. It wasn't only the inconvenience of her decline that bothered me. It was my need to see her as complete and vital. In other words, not dying. I found myself diving into a mixture of photos and memory for images of her former self. Snapshots from the 1940s revealed her as a sultry Jones Beach pinup. More all-American girl than second-generation Italian, she jazzed up her smoky complexion and cupid's bow lips with rouge and Coty medium-red lipstick. After we kids came along, Ma kept up a modestly glam appearance, still applying the medium-red when out and about in the neighborhood. Much later, fingers and shoulders bent with the weight of her years, she still held on to her femininity, coloring her white hair chestnut brown and keeping a compact handy at all times. "Let's figure this out," I said to Ma as I settled down next to her on the sofa. I took the sweater in hand, unraveled several inches of yarn from each sleeve, and refinished the cuffs. "There. That's better, Ma. So what do you want to make next? How about a hat for one of the grandkids?" We went shopping for the yarn right away, and later I sat with her to make sure she got the first few rows of the hat completed, the pattern set. She seemed like her old self again, confident in her craft, and I started to think I had jumped to conclusions. Maybe the chimp-sleeved sweater was an aberration. Knitting, like playing a piano, involved muscle memory, which I figured would be strong enough to override her intellectual losses. I was hoping Ma wouldn't mess up the hat. Given the situation, I had to wonder if I was trying to force something that might be causing more harm than good. And she didn't. Mess it up, that is, because you can't mess up what you don't work on at all. I stopped by her apartment after work a few days later. "How's what going?" she said. "Not bad," she said, "I just can't seem to find the time to work on it." Time? All the woman had was time. The sorry fact was that her failing eyesight and progressive dementia conspired to keep her from understanding the cryptic symbols and abbreviations of the knitting pattern. Ma had always been so competent, even in the most appalling circumstances. Widowed in a flash in her early forties, with three daughters to finish raising, she took the grim realities of a single-parent household in stride, keeping our family whole. I was 14 at the time, sandwiched between my 18- and 12-year-old sisters. When a parent suddenly disappears like that, you grow up fast. My sisters and I pitched in as we could, taking part-time jobs to help pay for Catholic high school, but it was Ma who made sure we never wanted for anything. We all married young and moved out, then went back to her place every Sunday to feast on lasagna or pot roast, followed by cannoli and espresso, gelatin for the kids. I have a photo taken on one of those Sundays in the early 1970s, the three of us sisters and Ma crowded together in her tiny pre-war kitchen. She was so young she looked like a fourth sister, having a good laugh with the girls. And she knit. When I was pregnant with my first son, Ma worried that my coat would not cover my expanding belly, so she knit up a thick woolen cape for me, complete with front zipper and side slits. How she got it done so quickly I'll never know. I can only guess that she sat up nights to finish it before my tummy outgrew my cloth coat. It was my turn now. If I could give something back by helping her feel useful, then that's what I would do. I tried writing knitting instructions in big, bold letters. I persuaded her to work on beginner projects—a two-stitch ribbed scarf, a one-stitch baby blanket—but no matter her enthusiasm at the outset, Ma quickly lost interest. It was around this time my mother agreed to give up her apartment. What with moving her into my sister's house, driving her to doctor appointments, and keeping her entertained, life in our family became all about Ma, who was now prone to shortness of breath from a failing heart. One day I walked in to find her gazing out at my sister's back deck, the forgotten knitting needles poking out of her tote like a pair of elongated chopsticks. "Ma! You have to make an effort," I said, far too sternly. What sin had my poor mother committed to warrant such a reaction? Oh, yes, neglectful knitting. I had to get a grip, and fast. Knitting or no knitting, I had to accept that my mother was floating away on a timetable of her own. A few months later I was in Oregon at my stepson's wedding when I got the call. "Come right home," my sister said, "Ma's had a stroke." It wasn't long before she stopped knowing who I was. Once she thought I was her long-gone sister Jenny, which is not as sad as it seems. If she could resurrect her beloved sister through me and transport herself to a happier time, then I was good with that. Ma had also lost the ability to use her right hand, which shut the door on any remnant of hope that she would ever knit again. But I'd bring my own projects along on visits to show her what I was making. "Very nice," she'd whisper, taking a close look at the stitches. Dementia be damned, Ma was still able to spot a good piece of knitting, and I'm not ashamed to say I got a kick out of having her approval. We were relaxing together one Sunday, Ma nodding off in her wheelchair, me on the sofa struggling with the crossword. I got up to stretch, then reached into my bag for the lacy mohair scarf I'd been working on. Time for a little experiment. I stepped behind the wheelchair and encircled her arms with my own. "Come on, Ma. How'd you like to knit a row?" She was startled at first, then reached down to examine the scarf with a critical eye, the way knitters do. I took that as a yes. "Here, pick up the needles . . . like this." Gently, I took her hands in mine and guided them through half a dozen stitches, amazed at how skillfully her bony fingers moved under my own. I felt that I'd resurrected a little piece of her, probably more for my satisfaction than hers. But her attention waned, and soon, with no apparent interest in pressing on, she let the needles clatter into her lap. Barbara, this is beautiful. My mother and grandmother are knitters but I am not good or consistent enough to claim that title. You do such a wonderful job of showing us your ma, and sadly, relating to her decline.